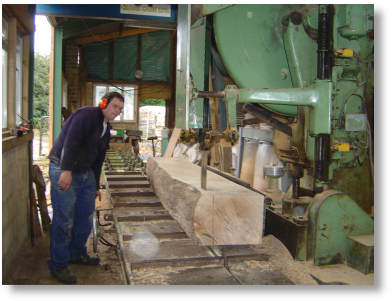 In 2004 we constructed a sawmill on our premises to convert the hardwood and softwood trees, which we get from the forestry and tree services side of our business, into timber. This allows us to further our recycling, and at the same time provide you with quality hardwood or softwood timber which is much more environmentally friendly, having not travelled halfway round the world to get to you; in fact the majority of our timber has travelled less than 50 miles! Much of the softwood timber we produce is pressure treated and used as materials on the fencing side of our business; chances are we can even tell you where your new fence once grew! 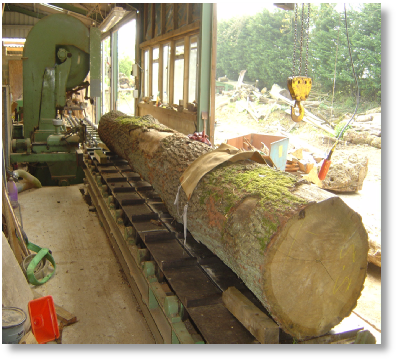 Our sawmill is fully equipped with all of the necessary machinery to produce timber to a very high standard. The logs are first broken down by our large Stenner 48” Bandsaw capable of handling logs 25 feet long (7.5 metres) and 4 feet (1.25 metres) in diameter. The broken down timber can then be cross cut to length, re-sawed on our Wadkin Re-Cut Saw, and planed if necessary. We can also produce round timber using our large wood lathe. Whether you are a builder, master craftsman or a person interested in wood just as a hobby, we can supply you with the right timber for the job, cut to your requirements, hardwood or softwood. 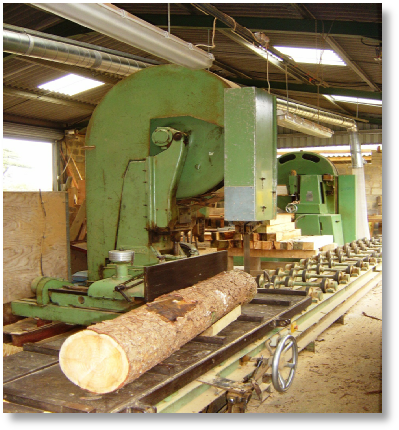 Although we have only recently constructed our sawmill, we have supplied timber since the company was founded back in the 1960s. Before our sawmill was built, we had the use of other sawmills in the local area to convert our wood for us, and in the past we have supplied crux beams to English Heritage, as well as supplying a large quantity of Oak beams, floorboards and lintels for use in the many barn conversions that have been completed in the local area. As well as supplying heritage projects and builders, we supply wood to many local hobbyists and craftsman for wood carving, turnery, furniture making and general D.I.Y.